A year ago the Metropolitan District Commission, the Capitol region’s water and sewer agency, approved the sale of up to 1.8 million gallons of water a day, with a volume discount, to a water bottling plant to be built in Bloomfield by the California-based Niagara Bottling Co.
A lot of area residents didn’t see this coming, and when they learned of it, they were profoundly unhappy. Angry citizens and some legislators denounced the agency (and the Bloomfield Town Council) for a lack of transparency and poor judgment in giving a large amount of “our water” to an out-of-state corporation, an operation they say will induce considerable truck traffic and spew millions of plastic bottles a day into the waste stream. MDC officials said they have plenty of water, with industrial water consumption in a long decline, and so were doing the responsible thing by selling some of it to help keep costs down and help a member town add jobs. Critics countered by saying a vital natural resource shouldn’t be handed over in large quantity to an out-of-state corporation when local residents and businesses might need it someday, what with an uncertain climatic future. As if to bolster the point, 2016 saw the state go into its worst drought since the 1960s. Opponents of the Niagara project were, and are, piqued at the thought of big trucks hauling away MDC water while they are being asked to conserve it. And, the MDC’s challenging year has been further complicated by the possibility that its largest member town, Hartford, could go broke in 2017, putting a major financial burden on other towns to pay some or all of the capital city’s sewer bill. Is the state’s water supply adequate and adequately protected and coordinated, especially in time of drought? Officials think so but aren’t sure. Two water planning processes are under way to answer those questions. Is the MDC responsive to its member towns, and if not, can it be made more open and accountable? The MDC is poised to suspend the volume discount at its meeting today and to appoint a consumer advocate to improve transparency and communication with member towns. For decades, Connecticut residents took water for granted. There hadn’t been a major drought since the 1960s, though there were smaller ones in the 1970s and early 1980s. The state was water-rich, or so went conventional wisdom, so no one thought much about it. People turned on the tap, nice clean water came out, life went on. But several events in this century, here and across the country, have draw attention to the state’s water situation. The Bloomfield controversy was one, as was the Flint, Mich., water crisis which came to light in 2014. Two other state incidents involved the University of Connecticut. In 2005, UConn pumped too much groundwater from its well fields, causing part of the nearby Fenton River to go dry. This embarrassment — fish died — was a wake-up call; university officials embarked on an ambitious and successful water conservation program. But by late 2012, with expansions including a new industrial park, the school needed more water than its well fields could provide. Three providers expressed interest, including the MDC. 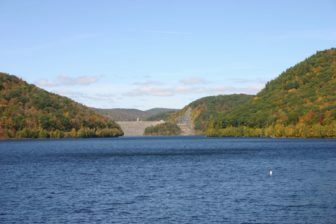 West Branch Reservoir with a view of the Colebrook River Dam from the Goodwin Dam. The MDC proposed piping water from East Hartford to Mansfield, a distance of almost 20 miles. This provoked opposition from residents of the Farmington Valley, who questioned whether piping water out of the Farmington River watershed, where the major MDC reservoirs are located, might have a negative effect on the river. MDC officials said it wouldn’t, and that its reservoirs had plenty of excess water, but that didn’t resolve the dispute (though the MDC didn’t get the UConn contract). Critics decided to consult the state water plan to see if piping water halfway across the state was acceptable. They learned that there was no state water plan. As it happens, there had been periodic efforts to come up with a water management plan. In 1985, the state created a drinking water supply planning process that involved dividing the state into seven regional Water Utility Coordinating Committees, known by the clunky acronym WUCCs. Each was supposed to prepare a plan. But, only four of the regions prepared plans and only one of the plans was actually approved. In 2001, the state created a Water Planning Council to, among other things, produce a statewide long-range plan for managing water resources. Though the council worked at it, no such plan was forthcoming. But now interest was running high. A Farmington Valley legislator, State Rep. John K. Hampton of Simsbury, convened a “water summit” in late 2013 and successfully pursued legislation the following year that mandated creation of a state water plan. That process, which involves four state agencies and a consultant, is under way, with public hearings and a final draft expected in 2017 and submission to the General Assembly in early 2018. Though the legislation has 17 separate requirements, they mostly focus on where and how much water we’ve got, where it is being used and where it is likely to be used in the future. This is significant; for the first time there will be a statewide accounting of the state’s water, said Lori Mathieu, head of the Department of Public Health’s drinking water section. We’ll know who the major users of water are. The process should enable a discussion of balance among users and uses, regulation, conservation and, hopefully, allocation — how water should be fairly distributed in the future. There is a second water planning effort that is also moving forward. The Department of Public Health revived the WUCC process a few years ago, this time with three planning areas – west, central and east – rather than seven. Why two planning efforts? The WUCC focus is narrower in scope than the state water plan; its main thrust is to coordinate plans among the existing water providers so that no one runs out of drinking water. Part of this process is to determine which entities will provide water service where — the creation of “exclusive service areas” around the state. The state has a mishmash of large and tiny water systems, public and private, 2,550 in all; some large such as the MDC but many tiny — some provide water to a single restaurant in a rural area or a single street. (There are also 350,000 private wells). Some of these small systems lose money and are in need of upgrade and repair. Should they fail, the WUCC process hopes to have some entity in place to cover their service areas so their customers can continue to receive water. Under the WUCC process, some water systems will expand their service areas, and under state regulations can use their grandfathered status in the new service area. State officials think this is unwise because if a water system that covers town A also picks up adjoining town B, there is no way of telling whether it has enough water to supply both towns. The result could be another Fenton River; indeed, last summer part of Coppermine Brook in Bristol was pumped dry by two nearby water companies. Under the proposed change, expanded use will require a new permit. As the planners were getting to work a year ago, here came the Bloomfield bottling plant controversy, evidence to critics of the need for a state water plan and changes at the MDC. Virtually everyone, present critics included, agrees that the MDC has been a remarkably successful regional entity, in a state not known for them. Founded in 1929, the MDC has provided superb drinking water for nearly 90 years, and kept its intricate hydraulic systems in good repair. It oversees a hugely popular system of parks and woodlands. Its $2.3 billion sanitary and storm sewer separation project is one of the most aggressive clean water projects in the Northeast. “We are lucky to have the MDC,” said Whit Osgood, a nonvoting commissioner from Glastonbury, one of several nonmember towns to receive water but not full sewer service from the MDC. For its many accomplishments, the one complaint that’s been aired from time to time — and in spades over the Bloomfield controversy — was that the commission wasn’t always transparent or accountable to its member towns, that it sometimes ran like a private rather than a public entity. “The District,” as it is sometimes called, is run by a 29-member board of commissioners; 17 appointed by the member towns, eight by the governor and four by legislative leaders. There also are four ex-officio commissioners from non-member towns. The board chairman is the sometimes controversial former Hartford state senator William A. DiBella. The MDC is technically a city; it is a specially chartered municipality with many of the powers of a city. Over the years it has done such things as run a trash-to-energy plant, build roads, run a hazardous waste collection program and managed parks, along with its water and sewer responsibilities. If the transparency issues could be resolved, it is conceivable that the agency could run other regional services, such as public works. Today the agency has 17 million gallons a day of excess water above it’s state-regulated “safe yield” of 77 million gallons a day. DiBella said even with the volume discount, which applies to entities that use more than 500,000 gallons a day, the MDC would net $3.8 million a year when the bottling plant is fully operational (it is nearly ready to open). Herein lies a philosophical difference with critics of the Niagara project, who believe that in a time of climate uncertainty, incentives should favor conservation rather than consumption. As if to bolster this point, New Britain, whose reservoirs are low, exercised an option to buy 5 million gallons of water a day from the MDC. Critics found fault with the entire Niagara process, believing it went too fast and without adequate public notice and participation. “I’m appalled at how this was handled,” said West Hartford council member Beth Kerrigan. Subsequent events haven’t helped. In March, retired Bloomfield physician Valerie Rossetti, a critic of the Niagara project, asked the Department of Public Health to see the MDC’s 800-page water supply plan. She was turned down because the MDC had just had the entire document designated as “protected critical infrastructure information” under a post-9/11 federal program designed to prevent damage to public infrastructure by terrorists or others. 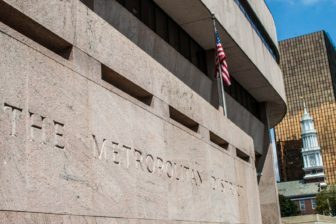 This led to a Freedom of Information hearing in the fall and a settlement in which the MDC agreed to release noncritical information from the plan. The plan is currently being redacted. The summer also brought the disquieting news that seven of the eight member towns would have to come up with a reserve fund in case Hartford becomes insolvent in 2017 and cannot pay its sewer charge. Mayor Luke Bronin has said the city can make the first two quarterly payments, but, facing a $50 million deficit in the budget that begins July 1, 2017, the next two might be iffy, barring some kind of state intervention. Town leaders were not happy, but the MDC has adopted a budget with a rate increase to cover this contingency. DiBella said the reserve is necessary to protect the agency’s credit rating. The reserve issue aside, the MDC has apparently listened to its critics. The commission is expected to to suspend the volume discount that would benefit Niagara at its meeting today. Also, MDC counsel Bart Halloran acknowledged that communication with member towns “is a problem that hasn’t been entirely solved.” Part of the problem, he said, is that members of the public rarely attend MDC meetings, which tend to be dry and technical. To improve communication, he said the MDC is strongly considering naming a consumer advocate, who would keep the towns informed about commission initiatives and activities. 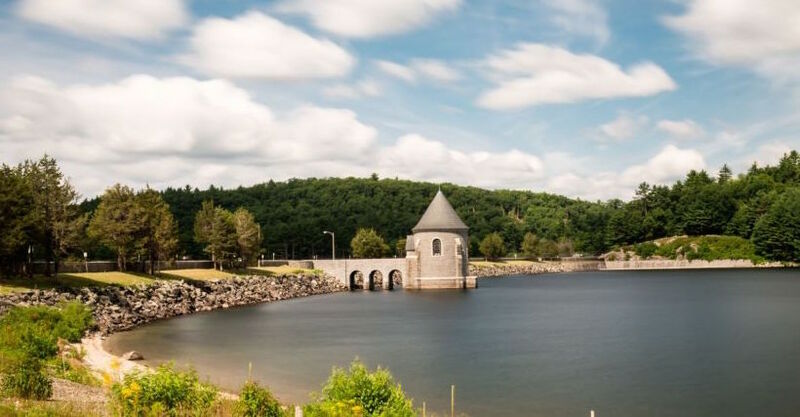 The South Central Connecticut Regional Water Authority, which serves 15 towns in the New Haven area, has such a position. One way such a position might have helped: Niagara was here a couple of years ago, seriously looking at building a bottling plant in the area. Had there been widespread knowledge of this, the water bottling debate could have been held then. Be that as it may, the final act of this complex water ballet is likely to be played out in the upcoming session of the General Assembly. The Niagara proposal rankled a number of legislators, including State Sen. Beth Bye, a longtime critic of plastic water bottle proliferation. She got a bill passed in the Senate — though it got no further— that would have limited the amount of water that commercial water bottling companies can withdraw from Connecticut water sources for sale out of state, eliminated volume discounts and given preference to residential water customers during times of drought or other public drinking water supply emergency. Even with the discount gone, advocates will be back at the Capitol in the upcoming session. The grassroots protesters in Bloomfield have formed into two groups: Bloomfield Citizens, which is keeping an eye on town government, and Save Our Water CT, which is taking an active role in monitoring state water policy. The group has a core of about 20 people and an electronic mailing list of about 3,000, said Rossetti. Their fear is that there is nothing in place to stop another water bottling plant from setting up shop in the state, so they will push for some form of state regulation of water bottling plants, as well as drought protection and conservation pricing, she said. Another bill likely to rise, first proposed last year by Rep. David Baram of Bloomfield, would require that applicants for town land use permits describe the nature of the project on the permit application. Apparently two Bloomfield commissions approved the Niagara project not knowing they were voting on a bottling plant. Bye said she is studying the structure of the MDC to determine if legislation is necessary to improve transparency and communication. Perhaps the appointment of a consumer advocate will suffice. 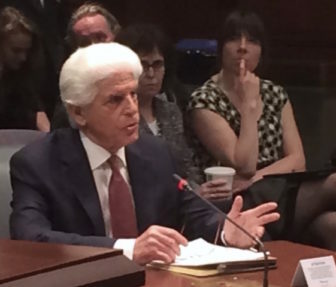 DiBella said — and here many critics would agree — that too much regulation of large water users could inhibit economic development. It’s bottled water that sticks in their craw. Though U.S. consumption of bottled water has risen to more than 11 billion gallons annually, and it is obviously helpful in emergencies such as Flint’s, environmentalists still oppose bottling plants across the country, seeing their product as a danger to local water supplies, a waste of the water and petroleum products used to make and transport plastic bottles and a major solid waste headache, because only about a fourth of plastic bottles are recycled, according to the Ban The Bottle campaign. This will probably be the subject of a legislative debate, one that should make clear that people are no longer taking water for granted. “In my 28 years of working on water-related issues, I have never heard so many people talking about water,” said Betsey Wingfield, bureau chief of the state Department of Energy and Environmental Protection’s Bureau of Water Protection and Land Reuse. That makes it an ideal time to “plan … and make any changes that are necessary” to ensure the state has ample plenty of water in the future. Whether it’s expanding access to education and health care, rebuilding roads and cities or making taxes fairer, leaders have many ideas to reduce wealth inequality and promote prosperity. But they remain uncertain about how to solve this crisis while Connecticut simultaneously grapples with a historic debt burden that also threatens its future. Shoreline resiliency against sea level rise and flooding in Connecticut is largely in the hands of local governments. But with money tight and local budgets reliant on the taxes shoreline properties generate, efforts to protect coastal communities from climate change have been slow and underfunded. Some communities, however, are making more progress than others. Connecticut is fortunate it hasn't been hit by a tropical-style storm since the successive storms of Irene and Sandy in 2011 and 2012 swamped the coastline, illuminating its vulnerabilities to the effects of climate change. That's because there's a general consensus that if either of those storms were to hit now, they would be just as damaging. Gov. Dannel P. Malloy, keenly aware of the unwelcome role his record is playing in the campaign to succeed him, spent one of his final State Bond Commission meetings Thursday defending state borrowing made during his tenure to promote economic development statewide and help Connecticut’s struggling capital city. While Connecticut’s distressed cities often are perceived as having bloated budgets, the wealthy suburbs easily outspend their urban neighbors on a per capita basis, sometimes by margins nearing two-to-one. More importantly, shrinking state aid, a lack of revenue diversity and an over-reliance on a regressive property tax system threaten to widen tremendous disparities that already exist between Connecticut’s poorest and richest communities. Second in a series.